Josh Daniels grabbed a goal in Glenavon's weekend win over Ards by 3-1. It proved Danske Bank Premiership delight alongside goals by Andrew Mitchell and Sammy Clingan - with Daniels taking time out of the post-match celebrations to reflect on his personal goals, life with the Lurgan Blues and lining out beside boyhood team-mate Ben Doherty. Josh Daniels enjoying life at Glenavon, Pic by INPHO. 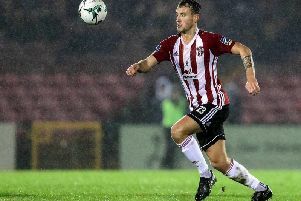 Daniels and Doherty both progressed up the ranks at Derry City before moving into the Irish League, the former on a permanent switch to Glenavon and the latter on loan terms. Daniels highlighted his enjoyment at playing in a free-flowing Glenavon side but also offered a view, as a lifelong City fan, on Derry's recent managerial change.